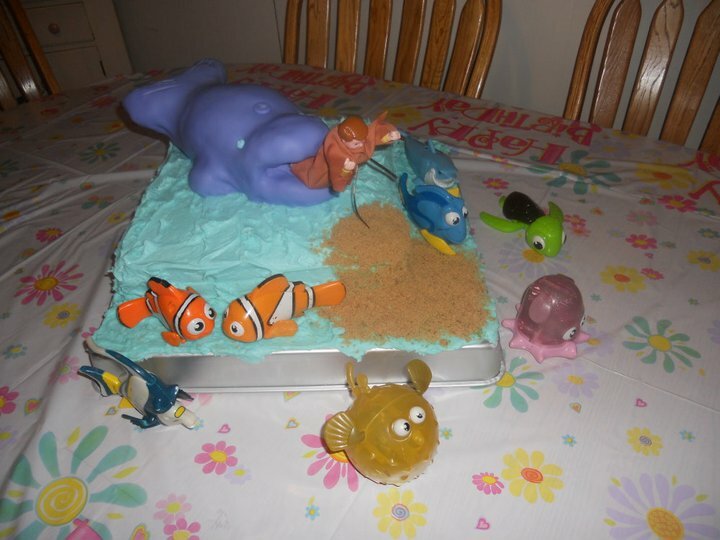 My little girl had a Jonah Birthday Party 2 years ago that was mixed with Nemo characters since that is her favorite bible story and her favorite movie. We love to watch Cake Boss and decided to create our own crispy treat, fondant whale. We made rice crispy treats like you normally do and then as it was still warm we molded it into the wale body. It took two batches and then a little time with a knife afterwards making it look more like a whale and less like the lochness monster! Then we smoothed buttercream icing all over it and carefully added the homemade fondant. We also used Buddy’s famous recipe for the cream cheese pound cake and chocolate gonache filling. Just for future reference… don’t bother… just use a regular pound cake recipe. It cost way too much for all of the cream cheese, butter, heavy whipping cream etc, was way too rich and I cannot begin to imagine how bad it is for you. Then regular butter cream icing dyed blue and some brown sugar for ‘dry land.’ I stiched up a robe for their little fisher price man and added a ribbon belt. We were going to add blue twizzlers coming out of his spout but we forgot and then ran out of time. This was actually a pretty big cake, the picture doesn’t do it justice.